It’s long overdue, but finally the Federal Motor Carrier Safety Administration (FMCSA) has eased the requirements for active duty and military veterans to obtain their commercial driver’s license. This is exciting news for military personal and trucking companies. Too many of our brave and selfless veterans struggle to find good employment when they retire, even in jobs that would utilize the skills they have mastered, such as driving trucks and other heavy machinery. 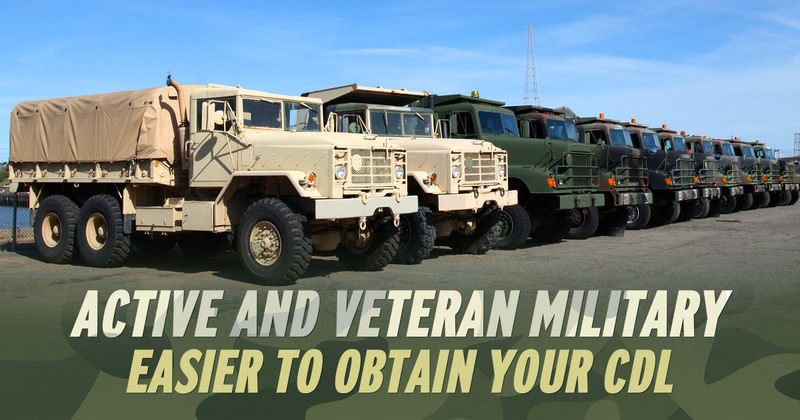 The first step for active duty or military vets who have CMV driving experience in the military is to take a skills test. This opportunity used to be available only for 90 days, but the waiver has now become available for a full 12 months from the date of discharge. On top of that, CMV training will now be credited towards the applicable CDL training and knowledge requirements. This eliminates many of the redundant hoops vets must take to obtain their permit and license. Has never had their standard or CDL license suspended, revoked, or cancelled. Has only one license in addition to their military license. Has not been convicted of qualified motor vehicle offenses—drug, alcohol, hit and run, motor vehicle felony, negligent operation, and more. Only has one or less serious ticket and/or traffic violations—driving in excess of 15 mph, reckless driving, tailgating, fatal motor vehicle accident, erratic lane change, driving a vehicle without proper class or endorsement, texting while driving, or talking on mobile phone while driving. The great thing about choosing a career as a local or long-distance truck driver is that you are in a field where dedicated and dependable drivers are always needed. No matter what state you live in, truckers are always needed to transport products, supplies, and goods locally and around the nation. Since finding good paying jobs remains a challenge for far too many of our veterans, these eased regulations are exciting. Plus, who better to fill the need than some of the most dedicated and disciplined people around. If you have 2 years CMV driving experience and no driving or legal disqualifications—it is faster and easier than ever to obtain your CDL. We encourage active duty personnel to start the process in the months before discharge, so you can begin applying for trucking positions as soon as you are available. At the very least, if you have the experience, why not obtain your CDL? It is easiest to obtain within 12 months of discharge and will provide you with a solid career choice if your other plans fall through. Your experience driving a heavy military vehicles is a skill that can be leveraged to gain employment in the civilian world. Help us spread the word! Hunter Tires Sells Semi Tires and Bus Tires. Questions about commercial tires? We are here to help.